There is a documentary that was originally released in 2007. 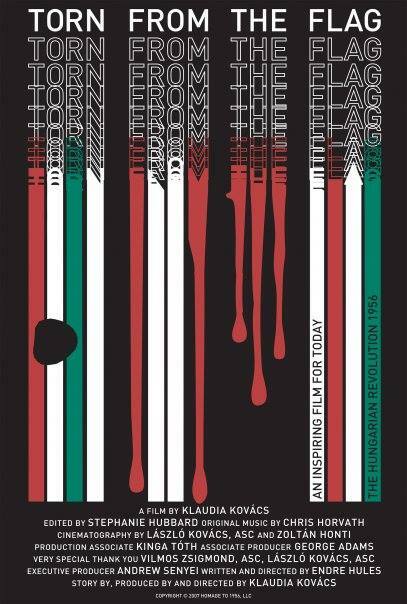 The title of the documentary is Torn From The Flag. The film is about the 1956 Hungarian Revolution and the eventual decline and demise of Communism. The force behind the documentary is Klaudia Kovacs. Besides being a director and producer, Kovacs has written over 200 articles and co-wrote 2 books on the Hungarian language. The film was based on an idea from Kovacs, who produced and directed it. The writer for the film was Endre Hules, who helped direct as well. His credits, acting, producing and directing, date back to the late ‘80's. The Director of Photography was Laszlo Kovacs. His work includes Ghostbusters, Miss Congeniality and Easy Rider. Vilmos Zsigmond was of the cinematographers. Credits for him include The Mindy Project and numerous films. One of the other cinematographers was Justin Schein who mostly worked on documentaries such as One Nation Under Dog and My So-Called Enemy. The third cinematographer listed for the film was Zoltan Honti. His work includes 13 Sins and The Last Exorcism. The editor for the film was Stephanie Hubbard. Her work includes the documentaries Bible Storyland and Journey Home. Music in the film was done by Chris Horvath. His credits include work on several television shows, including Scrubs and Grey's Anatomy. The film has a runtime of 1 hour 35 minutes. The Hungarian Revolution occurred before I was born. I learned a little about it in school but not much. But as a teen and young adult, I was very much aware of Communism. It was generally thought that we, the people of the U.S. and our free world allies, would eventually help stamp out Communism. And that those countries that lived under Communist rule would soon be free, democratic societies. But that was an undertaking that took decades to accomplish. And, according to this documentary, the decline of Soviet controlled Communism began in 1956 with the Hungarian Revolution. The film has interviews with people from all walks of life, who somehow were involved with Hungary and its struggle to become a free and democratic nation. Interspersed with the interviews are news and film clips keying in on specific events that were relevant to the revolutionary movement. The first interview is of Dr. Otto von Habsburg, the heir apparent to the Austo-Hungarian Empire. He talks about the cold war and how it affected Hungary. How the Yalta Conference during World War II gave Hungary to the Soviet Union, effective ending any kind of self-governing by the Hungarian people. Henry Kissinger is also interviewed. He claims that the American president, Roosevelt, didn't understand the Communist theology under Soviet leader Joseph Stalin. Then there is an interview with a man who was a boy at the time of the Soviet takeover of Hungary. He tells of rapes, taking of lodging and food by the occupying Soviet troops. Someone else tells of the theory of Communism that was being touted to the Hungarian people and the world. That is there would be equality, freedom and the fair distribution of property. It seemed like a great idea at the time, and the common thought was that Communism would soon rule the world. One particularly chilling interview was with a woman who had been a member of the Communist youth movement. She indicated that, had anyone suggested it, she would have become a suicide bomber. Apparently, that is how indoctrinated that the Hungarian youth were to Communism. Not too unlike what we are currently seeing coming from fanatical factions in the Middle East. The Hungarian dictator, Matyas Rakosi, was discussed in detail. The secret police and how informants were used to rout people from their homes and businesses were described in various interviews. One thing that was talked about that I had heard of while growing up was Radio Free Europe. Henry Kissinger explains that this medium was used to let people under Communist rule know that the U.S. and its allies were thinking about them and were trying to support them any way they could. Then it's on to Stalin's death and the installation of Nikita Khrushchev as the Soviet leader. He was characterized as someone who spoke without thinking things through. Not too unlike a current U.S. Presidential candidate. And then came the huge demonstration by students, academics and workers in 1956. Aside from economic issues, the people just wanted the Russians out of Hungary. That sparked the revolution to try to drive the Russians out. News clips and interviews show how the revolution unfolds and how the West, particularly the United States, assumed a hands-off position, apparently not wanting to risk a nuclear war over what was happening in Hungary. According to one of the people interviewed, there were over three thousand deaths during the revolution and more than twenty-two thousand wounded and hospitalized. The film deals with the massive amount of refugees who fled Hungary after the revolution and subsequent new invasion by Russian troops. Again, not too unlike the recent refugee crisis in Europe. The film winds down with showing how Hungary became more of a capitalist type of country, with progressive attitudes and commerce. And that how, over time communism took a back seat to the needs and wants of the Hungarian people. The film was definitely an eye-opener for me. As I mentioned, I knew very little about the Hungarian Revolution before viewing the film. But I actually learned a lot about what happened and the geo-political landscape at that time. The so called Cold War was in effect and there seemed to be a lot of posturing by both free world and communist leaders. The interviews were well done, capturing the angst of the people, how terrifying the times were and how, with a glimmer of hope, that Hungary could become a free nation once again.